Lots of people have heard of counselling, but when it comes to Family Therapy, many are in the dark. Plainly put, individual counselling is about a single person—sessions help them to explore and unravel their struggles, motivations and behaviours, and find healthier ways to navigate these. Family Therapy adds a new dimension to this, by including at least one another person in the mix. It looks at the dynamics between couples, siblings, parent and child (and any other pertinent genealogy) to discover the way the family unit functions. Every family has their own method of processing information, conflict, grief and change, even if it is simply sweeping it under the rug. Family Therapy enables families to uncover these strategies, look at why we do these things, and gives you strategies to build healthier relationships moving forward. 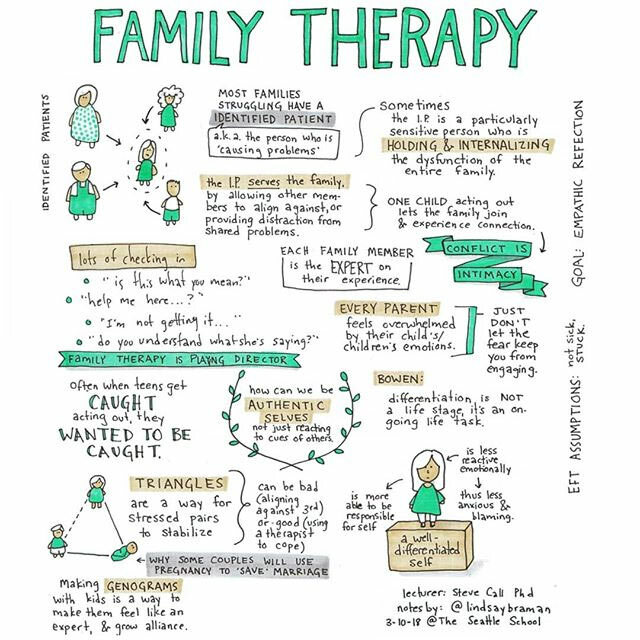 We came across this graphic by Lindsay Braman, who summarises Family Systems Therapy theory into interesting and colourful illustrations. 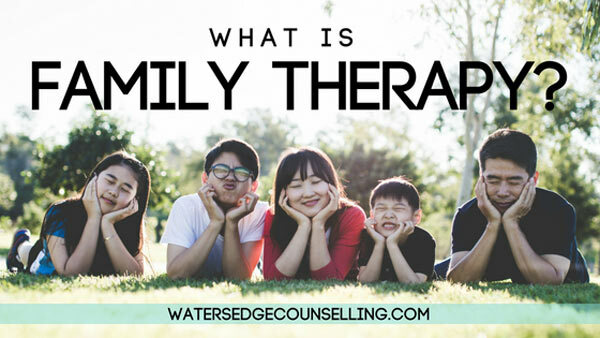 While you may not know the ins and outs of theory like your therapist, it helps to know what you are entering when you begin Family Therapy. This illustration is a great place to start. These notes highlight the fact that often, Family Therapy begins in an effort to help one member of the family who is struggling. But really, the process involves every member of the family, and each individual has something important to bring to the table. Before we enter therapy, we use techniques like taking sides or triangulation to survive conflict, but Family Therapy gives people the ability to retell the experience from their own perspective and find their authentic self—someone who is a part of the family unit, but is not defined by it. Take a look at the illustration below and see if you can relate to anything in it. Does your family unit behave like this? Maybe you want to explore what it means to be your healthy, authentic self while still supporting your family. Or perhaps, you have had a family history marked by brokenness and separation, and you need a safe place to process this. Family Therapy gives you the opportunity to do all this and more. To see the clinical notes that Lindsay included with this illustration, visit her website here. And while you’re at it, browse the rest of her work. You might just find out something new about mental health and family relationships. These topics don’t have to be scary or overwhelming, and Lindsay shows just how relevant they are in our everyday life. Did you want to know more about Family Therapy? Here’s what you need to do: Contact Colleen on 0434 337 245, Duncan on 0434 331 243 or Rachel on 0422 177 193 for a FREE 10 minute consultation on how we can best help you or book online now.